– Harmony: We live and work in balance with the environment. – Responsibility: We have responsibility for protecting nature and the planet. – Innovation: We continually strive to find new methods and approaches to our work. – Solidarity: We bring local communities and stakeholders together in our work. – Partnership: We are partners with a variety of actors – both international and national. Green Asia Network carries out afforestation projects in Mongolia, specifically targeting areas damaged by climate change and desertification. 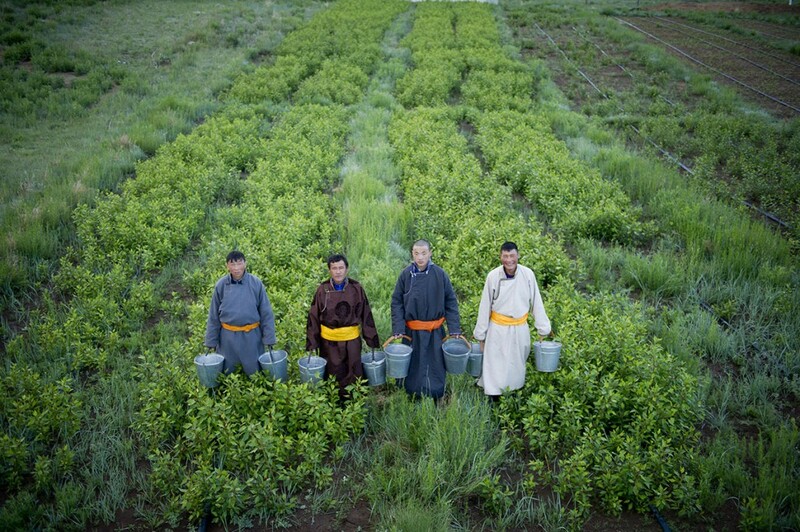 As indigenous trees, including fruit trees, are adapted to dry climates, we’ve created a sustainable community development model through the cultivation of fruit trees and cash crops with help from various Mongolian and Korean partners. Along with these forestry projects, we have also built eco-villages, conducted sustainable land management training and launched an environmental campaign. Climate change and desertification in Mongolia have been exacerbated not only by the reduction of grassland but also by severe winters called dzud. In 2002, nearly ten millionherd animals died leaving twelve thousand herders in poverty. In 2009~2010, thedzudkilled approximately eight million herd animals(one fifth of the entire herd population in Mongolia) and produced twenty thousand eco refugees. Sixty percent of the herders who lost their homes and livelihood were forced to live below the national poverty line with no electricity or water in urban ghettos. Eco-tour participants recognize the seriousness and damage brought on by climate change and desertification. They dig wells and plant and manage trees as part of anexperienceto feel a new sense of nature and culture. During the program, attendants think about the causes of the environmental crisis and try to find alternatives. They also study the global challenges and achievements of visiting international organizations. Green Asia Network’s Eco-tour has two principles; ‘Labor is a pleasant education’ and ‘Sharing’. Through the Eco-tour program participants learn to respect their global village neighbors and to become global citizens. Using its accumulated experience in climate mitigation and adaptation, Green Asia Network promotes projectsthat encourage ‘Community participation in forestry and builds eco-villages’. Half of Myanmar’s population (30 million) is affected by environmental crisis, such as climate change and desertification. In May 2008, Cyclone Nargis killed over 138,000 people, and conditions only worsened from the drought and desertification in the Central Dry Zone (Sagaing, Mandalay, and Magway which occupies 12.8% of Myanmar and equals 87,200㎢ out of 670,000㎢), which continues to expand rapidly. We focus on climate change response and the development of local people’s self-reliance to address both the environmental crisis and poverty. In March 2013, we dispatched our staff to conduct research, including a field survey and a feasibility test for future projects in the area. After this initial preparation, we establishedGreen Asia Network Myanmar in Yangon. We also formed relationships with the Myanmar government, regional governments, experts from various sectors, activists, and residents for future collaboration and cooperation. Through these activities and our projects, such as community forestry and eco-villages in Myanmar, we are closer to realizing our vision of creating an Asia safe from climate change. Green Asia Network was established in 1998 with the vision of making Asia safe from climate change. Over the past 16 years, Green Asia has beenresponding to climate change through climate mitigation and adaption initiatives and poverty reduction activities in those areas hit hardest by environmental devastation. Since 2000, Green Asia Network has been engaged in developing sustainable villages to address local land degradation in Mongolia and Northeast Asia. These projects include combating desertification through afforestation projects and ecosystem conservation, promoting economic development and social integration, building ecological villages and sustainable communities, providing environmental education, conducting policy research and advocacy, and sharing knowledge and practices. In 2013, Green Asia Network opened an office in Myanmar to respond to the intensifying threat of natural disasters and desertificationin the region. This is a natural progression in Green Asia Network’s grand vision of bringing together the civil societies of South Korea and Asia to create “TerrAsia”, an international platform for public and private entities, international organizations and other various stakeholders to share, cooperate and collaborate on addressing climate change. Vision: An Asia safe from climate change. Harmony –We live and work in balance with the environment. Responsibility – We have responsibility for protecting nature and the planet. Innovation – We continually strive to find new methods and approaches to our work. Solidarity – We bring local communities and stakeholders together in our work. Partnership – We are partners with a variety of actors – both international and national.